We love space and everything to do with it. Give us a marathon of HBO’s From the Earth to the Moon or a late-night screening of Apollo 13, and we’re there. Heck, we even enjoy watching movies like Armageddon . . . sometimes. So yeah, we like space. But our like kinda pales in comparison to how much this guy likes space. 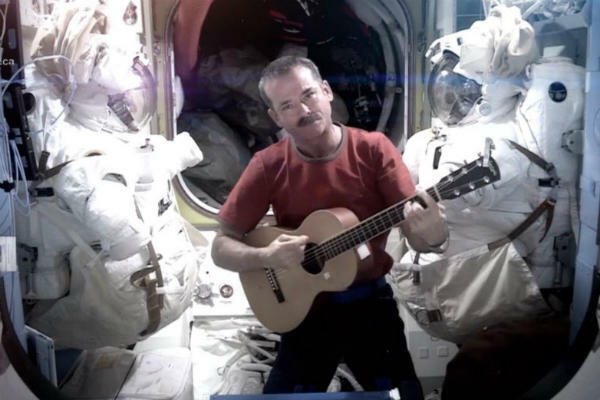 We’re talking about, of course, International Space Station Commander Chris Hadfield. To say Commander Hadfield is cool would be a gross understatement. Just watch this video and you’ll see what we mean. We don’t even mind that he’s Canadian. We kid, we kid. Angry Birds can rightfully be classified as a phenomenon. Between the countless downloads and the merchandise that sells like gangbusters the game has reached the top pop culture status. Rovio likes to keep the game fresh, with constant seasonal updates and other new level packs to keep the fans coming back for more. While these updates do present some minor new additions to the Angry Birds experience, there hasn’t been any major advance in the game play since day one. That is all changing with the impending release of Angry Birds Space, the next installment in the series, and the first to revolutionize it’s game play. Space will showcase gravity free physics, and force players adjust while sending their mad avian buddies through small gravity fields set up around the environment. Up until now the game play was a bit of a mystery, it was hard to imagine what that meant compared to the standard Angry Birds action. With the help of an astronaut, actually in space no less, Rovio has revealed exactly how this new physics will work in your pig hunting adventures. Beyond the massive cool factor of having an actual space inhabiting astronaut play with Angry Birds plushes to demonstrate gravity free physics, the game play on display in this new video is awesome. We can’t wait to get our hands on Angry Birds Space when it is launched March 22nd. Check out the physics showcase video after the jump. Bear is best known for his work on the hit Sci-Fi show Battlestar Galactica, but has written for multiple shows over the last few years. One of his recent highlights include the show Human Target, which earned him his most recent Emmy nomination. McCreary is an interesting choice for NASA, being a TV composer he is not all that well known and their is a history of people of John Williams-caliber writing music specific for events. That said, being familiar with his work I can assure you all that McCreary is an inspired choice, and I for one can’t wait to hear it.